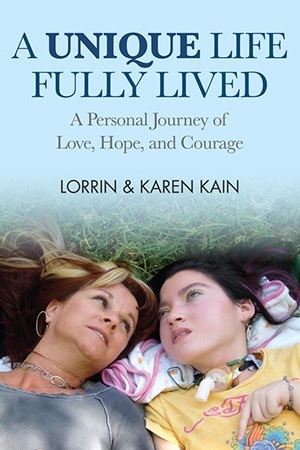 When I started reading “A Unique Life Fully Lived, A Personal Journey of Love, Hope and Courage, by Lorrin and Karen Kain”, I was expecting to go on an emotional journey with Karen and Lorrin. Little did I know how profound a journey this would be. I never had the privilege of meeting Lorrin during this life, but through every page of this book, I felt the force of her energy bursting through her mother’s words. I could feel Lorrin’s spirit in each and every page–it was that profound. I would read a chapter and have to put the book down to cry, to pray and to reflect on what truly “living” meant to me. Raising a special needs child can be very isolating and lonely. As parents, we are literally thrust into a life that we weren’t prepared for. The struggles and challenges of daily life are often too much to bear. All of the negative emotions–fear, anger, despair–weigh us down and life becomes a series of repetitive routines and hurdles to climb. This book gave me that perspective of being able to embrace the journey out of the darkness and into the light. There will always be obstacles. There will always be bad days. There will always be times when we feel there is no hope. But the lesson I learned is that no matter how difficult the journey, it’s still our journey and we have to live it with all of the love, light and positivity that we can. I was lucky enough to interview the author herself, Karen Kain, and ask her a few questions about the book and her life. We are excited also to give away a copy of her book. Just leave a comment on the blog and one person will be selected to receive a free copy! 1. When reading the book, it was very interesting to read the shift you made from being afraid to embracing the spiritual part of yourself through your journey. Was that an easy transition for you to make? In what ways did that benefit both you and Lorrin? NO! I really went in kicking and screaming after Lorrin’s injury. I did however learn that people were living with much more difficult situations than I was, and they were happy. I remember soon after her diagnosis being at a fair with my sister and her kids. I was carrying Lorrin in my arms and her body was limp, she had no head control. I ordered cotton candy and saw an adult who clearly had a disability and I thought to myself, “I can’t do this!” I cannot be that parent. It was my worst fear. But things only got worse. Lorrin was having terrible seizures and we were trying medication after medication with no positive results. I really had to dig deep into my beliefs about Lorrin and myself to try to understand how and why this was happening to me. Of course the first thing people talk about is Karma and being a young soul. That just didn’t make sense to me. I never felt guilty for what happened. I knew I was doing my best as a parent. I think the common thread is that I loved her and wanted to give her the best chance she could have. So I needed to change the way I was doing our life. That meant accepting her and loving her. I am sad to say that the accepting her took a long time it seemed to happen around age 3, when Lorrin almost died. I was faced with making unbearable life and death decisions. I had to let go of everything that life had taught me to that point and just love her and take the best care of her that I could. I watched her go through countless procedures and she never complained. She would wake up and give me that smile that melted my heart and bat her big blue eyes at me. She was ok. The more I learned to accept and enjoy her the more fun we had and the happier we both were. I learned that I needed to heal myself and my attitude and approach to her life. Lorrin was perfect the way she was. But, that does not happen over night. It took me years of surrounding myself with loving and peaceful people, truly peaceful. Not the kind that I have a brand new fancy car and I am happy for a week peaceful. No judgment. I surrounded myself with people who had higher thoughts and came from a place of love. I went to meditation every week. I read a TON of books on spirituality and life lessons. There are plenty of places to go to see doing amazing things with much less physical ability than me and I wanted to find my way to inner peace. 2. Having Lorrin be included at school and with her peers was very important to you. What do you feel are the benefits of inclusion for both special needs children and typical children? When parents of children who are neuro-typical they often meet by participating in school events. Lorrin was a Brownie and went on to be a Girl Scout and that was nice. But, she was missing that “best friend” connection. For her it was important. I also wanted that for her. She loved people. I felt in my heart that she wanted that she needed a Best friend. I talked to Lorrin about it and we agreed that it would be our goal for the year. We prayed about it and then I started to do anything and everything to make it happen. Getting a service dog was a part of that connection. For me, school was an obvious. She was going to school locally and it just made sense to me to start there. It was NOT easy. I got much resistance from school in the beginning. By law they had to accommodate her medical needs but it was not their job to support friendships. Middle school is tough. But, it is also a time that all kids are vulnerable. I got my hands in on every opportunity. I went to the school and met with the principle and let him know that there was a new kid in town and she was not going away. They quite frankly didn’t know what to do with us/me. I went to every function that was on campus. I made sure everyone knew that Lorrin was here for the next three years and she was going to be attending every event possible. One time at spirit night one of the teachers basically put her wheelchair in the corner. Did it hurt my feelings, of course! But I stood up and fixed it, I smiled and tried my best to send love to the situation. I picked my battles and held meetings explaining to the staff that Lorrin was here to teach. As you have read in the book I had many heart breaks. The staff didn’t want Lorrin at school, and certainly not in their class. The dances were all hard to get into each time for a wheelchair user. They forgot to put Lorrin in the yearbook the first year. I would walk into the office and the staff would cringe waiting for my next question that would make them feel uncomfortable. I went forward with love and sometimes (often) cried when I got home. But, we were paving the way for all students. That is my goal, not just for Lorrin. Many parents work and have other kids and cannot make the stance that we did. I feel that is what my souls work is to do what other more busy parents would like to and cannot. For now I will do it and then someone else when do it when I cannot. This week happens to be Lorrin’s Middle School Abilities Awareness Week. A number a great people started it 7 years ago and I believe Lorrin and my efforts greatly contributed to something wonderful. Teaching middle school students is critical. The beautiful thing was that you cannot force friendships, they just happen once you put your self out there. Did everyone want to be Lorrin’s friend? No. But it just takes a handful, maybe just one. I can only say that Sarah Rivera tells me all the time that being Lorrin’s friend changed the way she is living her life. She doesn’t understand why people think it is special. She did not see Lorrin as being disabled. She learned that Lorrin did things differently than her but they still had the basic things in common. They are soul mates. But lets not stop there. Lorrin changed the way people look at the their children. She brought people together and inspired many to try harder. It is a natural state. Lorrin was here to teach many and sent love to everyone she met. I think that is very powerful. I am so proud that she picked me to be her mother. I want to add that yesterday I had lunch with Sarah Rivera and she just finished the book. She told me that she had no idea how medically fragile Lorrin was. She never thought that she would die. 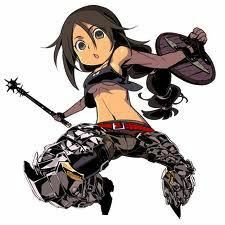 They all saw Lorrin as the fun girl with cute clothes. 3. What advice would you give to parents who feel overwhelmed by their child’s disabilty? What resources would you recommend? Attitude is every thing! I just sat in the ICU with a mom whose daughter was having status seizures for 3 days. She is a long time friend of mine. After she saw me speak at The Abilities Expo in 2012 she changed the way she was celebrating her daughter’s life. Her daughter never had a birthday party until I shared about Lorirn’s parties, she then got a bike after a year of fundraising. This mom knows that her daughter is not going to live forever but she wants to embrace the moment and enjoy the day. She understands the importance of her daughter no matter her ability. She focuses on the things her daughter can do and smiles even when it is hard. As parents get diagnoses we tend to first focus on what our children wont’ do. We create in our minds all kinds of “nevers”. There is grieving a dream of what we thought life would be. That is natural. But, the truth is that no one knows his or her future. We only have this moment. Each of us has to make a choice to accept the life we are living and make the best of it. That is the only way we can respect life is to be in the now. When we resist what is, we cause ourselves pain and we are disrespecting life. I first tell parents to take care of themselves. It is the last thing they want to do. Especially moms, I remember it well, doing everything until I was too exhausted to cope thinking I was helping. Take care of yourself first!!!! Then you can be a better parent. Gravitate towards people who are enjoying their children and stop focusing on the negative and quite complaining. It is contagious and can eat you up. Remember what you focus on you will bring towards yourself. So focus on the beauty of your child and the things that you enjoy together. The beautiful part is that there will be new dreams. When you open up to what is and live in the moment you will find yourself smiling and enjoying a different kind of life. I often feel that the highs are the greatest highs and the lows are the deepest lows. But, I know I have experience a journey of the soul. I have really lived and I have really grieved. I try my best each day to live. Lorrin gave me so many gifts and I have met some amazing people that I would have never gotten the chance to meet if she was “normal”. To be honest I found/find myself bored with people who have little depth. This business of uniqueness certainly gives depth to life. My advice about resources – get connected and stay connected. In today’s Internet family there is no reason to hide. Get out there. Don’t take everything so personally. We often feel burdened and beaten down and become over sensitive about things. Laugh, at yourself and/with your child. Ask questions and be the change that you want to see in others. As humans we all want the same thing and that is to be loved and accepted. We want our kids to have that. But often we smother them and sometimes parents just need to get out of the way. Let your child shine. They are unique and they have so much to offer when given the change. See the beauty. Please get out there and ask questions, open the door to opportunities of friendships, information and connection. I believe when you ask a question it will be answered. Learn to focus on what you want to bring towards you and the only way to determine what is right for you and your child is to follow your gut/intuition. You can only do that when you are connected yourself. Meditation, gardening and nature help to bring that around. Most kids I know who are unique LOVE nature, and that is free. Give yourself permission to enjoy the simple things in life. The small things become the big things. 4. What advice would you give to parents who may be concerned about vaccinating their children? The 64 thousand dollar question. I used to say educate and tell parents where to go. Now, I tell the truth and that is that I would not vaccinate. I am not convinced that we are in a place that vaccines are safe. I feel that it is getting worse. I tell people to go to my website and go to the vaccine awareness page. I try to have as much basic information up as possible. Then people can dig deeper. I am deeply concerned for the future of our children. Ever since I went through the horrible vaccine compensation program I don’t trust anything that is on television. I hope that there will be a day that I can tell parents that there are safe choices, but so far I honestly can’t. I am a huge fan of alternative treatments; cranial sacral, aroma therapies, acupuncture, massage, energy work and healthy eating. If you feel that you must vaccinate I would research the Lot number with VAERS before giving and certainly break up the vaccines. If your child is allergic or may be allergic, asthmatic and or skin sensitive I would give it much thought. Also pushing the schedule off til they are much older. My friend just sat in the ICU with a vaccinated baby of 4 months who had the whopping cough vaccine with whooping cough. This is tragic. I am scared for our future babies and their families. I want change. Shame on big pharma and the media for the lies that we are being told. It scares me and I hope my voice will at least make people think twice and educate themselves. 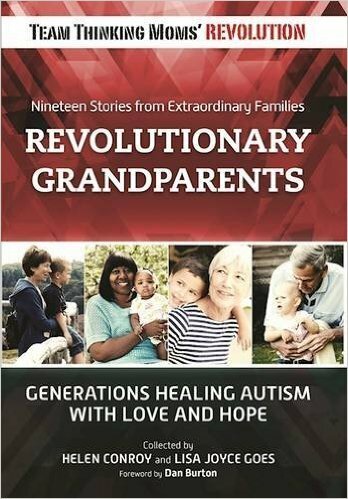 Karen Kain – a parent of a medically fragile, vaccine-injured child named Lorrin for fifteen years – teaches parents how to enjoy their children no matter their abilities. She shares how she bridged the gap from special needs to mainstream experiences in all arenas of life: best friends, slumber parties, concerts, camping, beauty pageants, Girl Scouts, school dances, musicals and endless travels. 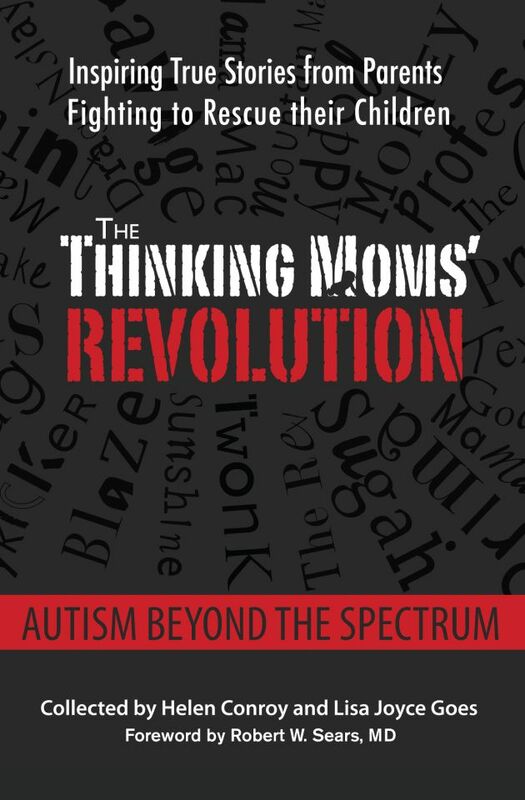 This entry was posted in 2019 Book or Product Reviews, Blogs by Thinking Moms' Revolution, Savage TMR and tagged A Unique Life Fully Lived, Abilities Expo, autism, Karen Kain, Lorrin Kain, vaccine injury. Bookmark the permalink. Thank you for sharing. The part about Sarah not realizing that Lorrin was so medically fragile made me cry. I had the pleasure of meeting Karen at Autism One two years ago. I was intrigued by the description of her presentation in the A1 schedule/booklet – about developing friendships in the special needs community. I arrived shortly after it started so didn’t immediately realize that Lorrin had passed away. About half way through I did, and my heart sank. You ladies are both such an inspiration! What a wonderfully enlightening and refreshing article! Thank you, Karen, for sharing the energy and ideas you found within yourself to maximize your daughter’s potential and enjoyment of life. Tears already at the dedication. Only on chapter 12 so far but so real and heartfelt are my emotions. Such great timely information that all soon to be mom’s and new mom’s should read before they are faced with vaccinating their children so if they do, they act quickly to qualify for help. Karen is an amazing mom and did some good recordkeeping. 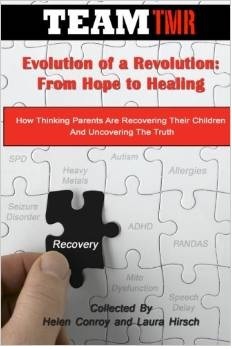 I would like to win a copy of the book to share but would be happy to share with someone here if they couldn’t afford it. Wow!That was amazing,and very well said! made me think about my experience when our son was diagnosed with autism at age two. The doctor acted like he was now a tragedy and that there was nothing they could do for him. Told me all the things he would never be able to do, like talk, socialize, play with other kids, be potty trained, etc. I could not believe what she was telling me. Because I could see so much more than that whenever I looked at him. I thought how dare she put limits on a child who is only two years old and hug me as if my child just died! I was furious. I spent the next few years researching everything about autism and vaccines and nutrition etc. Well now my son is 8 years old and doing everything that mainstream doctor said he would never do. He is the most social little chatter box who loves people and talks more than me! I never thought I would have to tell my autistic son to stop talking, but I do! And I feel guilty! He was 5 when he finally started talking and told me I love you for the first time ever! I have to kick myself every time I feel like telling him to be quiet! Because at one point, I was scared that he would never talk at all. But now look at him! My pride and joy! Inspiring! Thank you for sharing your journey!! I would love a copy of this book! If I do not win it, I will be sure to order it from our library. My son is 7 and I still struggle with 100% acceptance of his disability. I am almost there, but it could be better. Thank you for sharing your story! I remember feeling that I had not time to think about being the parent of an ASD child that I did not want to be. I still don’t think that I allowed myself to grieve this. Fabulous post of this author and her story!